Philippines latest happenings in news, celebrities and general life in the Philippines. Matt Wilkie, the original founder, is an expat in the Philiipines. Fantastic expat resource! 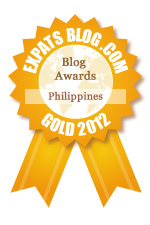 ExpatsBlog.com Expat Blog Awards 2012: Philippines Gold Award! This blog won the Gold Award for best expat blog in Philippines!